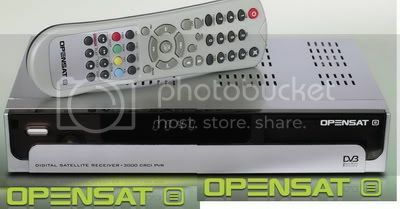 Satellite PVR Receiver OPENSAT 3000CRCI ,The OPENSAT 3000CRCI PVR is a small CI receiver with PVR. It has unusually small dimensions and there fore fits into any living room environment.The front panel features a four digit segment display and in the upper left corner the standby button. All other buttons and slots are hidden behind a flap. If you open this flap it reveals seven buttons to operate the receiver without remote control,a CI slot for all standard modules like Irdeto, Seca,Viaccess, Cryptoworks or Nagravision,a Conax card reader as well as a USB interface. The back panel is equally well designed and sports the usual satellite IF input and loop-through output, 2 scart euro connectors, 4 RCA jacks for stereo audio and video , a 0/12 control current, an optical digital audio output , a UHF modulator output, an RS-232 interface and a mechanical mains switch. The remote control that comes with the receiver sits well in your hand, boasts a convenient design and proper labelling. Even though the on-screen menu of the OPENSAT receiver is more or less self-explanatory the manufacturer provides a comprehensive user’s manual which solves any questions that still may arise. It deals with all functions and options of the receiver and provides screen shots and illustrations where necessary.The overall build quality of the 3000CRCI is very good and we had no complaints what so ever with the unit we received for testing. This receiver is not equipped with an installation wizard, which means that you have to start out with selecting your preferred language for the on screen menu. Once you have found this menu item the following languages are available: English, French, German, Italian, Spanish, Turkish, Polish, Farsi, Slovak, Slovenian, Czech and Hungarian. The main menu boasts a clear structure and is divided into six categories (channel list, antenna settings and search, settings, tools, games and PVR). The first step requires adjusting the receiver settings to the existing TV equipment. The PAL, PAL-M, PAL-N, SECAM and NTSC colour systems are supported and can be selected manually or you may choose the ‘auto’ function and let the receiver take care of everything.The video signals can be put out as RGB or CVBS, with S-Video and YUV not implemented by the manufacturer. The UHF modulator can be activated with a dedicated menu item with channels 21 to 69 being available for that purpose. Like all DVB devices the OPENSAT 3000CRCI is able to sync the local time with the time code transmitted via satellite.To make sure the time is correct you do, however, have to define the difference of the local time to GMT. While most other receivers require users to set GMT +/- x hours, this box shows a number of well known cities for each time zone which makes it easier to identify the appropriate zone, even when you’re not 100% sure how many hours offset you have. A separate menu item takes care of adjusting daylight saving time so that you never have to worry about changing the time twice a year. Some useful additional settings like OSD or channel switching options complete this menu item. Next, the receiver has to be familiarised with the existing reception system. It comes with a pre-stored list of 44 European satellite positions which is very up-to-date and well sorted.The colour-coded buttons on the remote can be used to add new satellites in a breeze, to edit existing entries or to delete outdated and unused entries. The receiver also has to know whether it is connected to a motorised or a fixed antenna as it supports DiSEqC protocols 1.0, 1.1, 1.2 und 1.3 (USALS). Thanks to DiSEqC 1.1 support multi focus antennas can be connected to the OPENSAT box too, just as well as dishes with practical USALS motors which only require the exact location of the antenna to find all available satellites. Various LOFs are preset so that C band reception is an option as well apart from Ku band reception. Even circular signals from LNBFs can be received and processed.Altogether the range of available LOFs is rather impressive, even though it is not possible to enter a specific LOF manually. The 3000CRCI sports a 4000-channel memory and in order to fill it with offerings from the sky you may want to either perform an automatic channel search for one or several satellites or a manual transponder search. For both modes you can restrict the search to free-to-air only, TV only, radio only or TV & radio. Network search can be activated if required.The integrated blind scan mode is a nice little treat as it allows finding and scanning transponders that are not (yet) on the stored list. We tried a standard search on HOTBIRD 13° East and the OPENSAT to ok 3:20 minutes and found 1235 TV channels and 456 radio stations. When activating blind scan on the same satellite the receiver finished after slightly less than five minutes and found 1132 TV channels and 431 radio stations. Both results are very satisfactory considering we’re in automatic mode here. For a manual search individual transponders can be selected,edited,sorted, added or deleted at the touch of a button. Here again, the colour coded buttons on the remote control turn the whole process into child’s play. The only thing we missed was manual PID input, which this receiver does not support. If we bear in mind that the channel memory is limited to 4000 entries it makes sense to think about adjusting the channel list according to personal preferences and above all to seriously consider deleting all channels you will never ever watch. All this can be done with the first menu category which reveals all channel list editing options. It goes without saying that not only the TV list but also the radio list can be rearranged in very much the same way.To all DXers out there: You might be pleased to learn that the complete channel list can be deleted at the touch of a button without resetting any other receiver settings at all. When you’re in edit mode either all available channels are listed or for sake of usability only channels from individual satellites are displayed.Again, the colour-coded buttons of the remote are used to add channels to one of several favourites list (which can be individually named), to delete, move or PIN-lock channels so that underage members of the family do not have access to unsuitable material on the TV screen. Listed channels can also be marked for skipping when zapping up and down the list. Whenever you’re in edit mode the current video is inserted in a small window at the right corner of the screen.The red button on the remote control opens a search window where you can simply key in the desired channel name while to the left of the inserted keyboard all matching hits are listed. While this feature is a god send in it self OPENSAT has gone that extra mile with implementing it in an extremely user-friendly way.The very good overall impression of this receiver is finished off with a zoom function,an integrated teletext decoder and multi-picture display of nine channels. 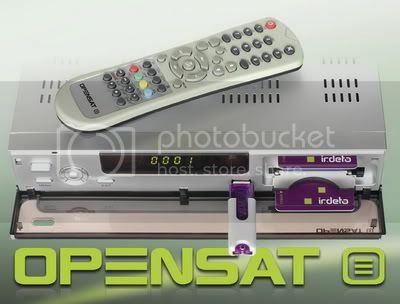 OPENSAT uses a tuner with a rather low threshold and therefore was able to pick up and process even weak signals such as the ones from NILESAT 7 West or ASTRA2D 28° East. The SCPC reception test was also passed with flying colours and our test transponder on TURKSAT with a symbol rate of only 2400 KS/s didn’t pose a problem for the 3000CRCI.The integrated CI interface worked just as smoothly in our test and accepted all modules we threw at it. The built in Conax card reader also worked brilliantly with our test card. The RS-232 interface can be used to update the operating software or to install a new channel list.To this end, OPENSAT provides a dedicated editor for PCs which is even SatcoDX compatible and consequently can be used to provide up-to-the-minute channel and transponder data to the receiver. In case you’ve been wondering why the OPENSAT 3000CRCI PVR receiver sports the PVR in its model designation here’s the answer: It’s all in the USB 2.0 interface on the front panel, which turns this OPENSAT receiver into a fully fledged PVR.Any kind of portable hard disk, memory card or memory stick can be connected to this port and will be recognised by the receiver in a matter of seconds. From that very moment all PVR functions become available, such as recording the current event, playing back stored files and of course time shift viewing. So next time you’re right in the middle of a great prime time movie when the phone rings you simply press pause, pick up the “phone” and continue from that very scene when you have finished the phone call.Naturally we tested all PVR features and found nothing to complain about. Eight timer entries can be created which also allow recording daily or weekly events without further ado. In addition to recording and playing back of TV and radio contents the receiver features an MP3 player and a picture viewer so that you can present your precious holiday photo on the TV screen next time. Or you may use the receiver as a juke box for an upcoming party.Software updates are also possible using the USB interface all you need to do is download the appropriate file from the manufacturer’s website, copy it into a memory stick and then start the update process on the receiver. 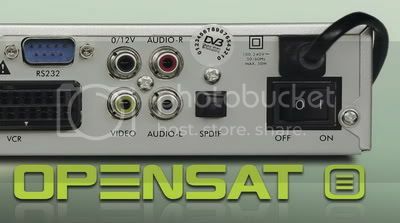 The only real draw back of the Satellite PVR Receiver OPENSAT 3000CRCI is the fact that a storage medium can only be connected to the front panel of the receiver. This in turn means that the elegant flap has to stay open all the time and reveals the somewhat less elegant inner front with all its buttons and slots. What we liked very much,however, is the ease with which recordings can be edited on the PC or burnt onto DVD. Thanks to portable external storage media it is as easy as ABC to connect them to the PC and therefore never again have to worry about transferring huge files from one device to the next.